Customer feedback is an expression of the customer’s opinion about a business, product, or service. In the Age of the Customer, a time when consumers are equipped with and empowered by tools, apps, and devices for engaging with companies — whenever, wherever — customer feedback can be found everywhere and shared across different media. It’s the passing comment the guest made at the reception desk upon checkout. It’s the filled-out comment card, the completed NPS survey response. It’s a social media comment posted on Twitter or Facebook, a two-paragraph tip on Foursquare, and the online review left on Yelp or TripAdvisor. It’s the set of notes from a phone call the customer made after dialing the number on your “Contact Us” page, and the results from a usability test you ran on the heels of a website overhaul or app redesign. You get the point: today, customer feedback can be generated, shared, and found across an unprecedented number of platforms and channels. How do you stay on top of it all? For companies that manage multiple business locations, or large organizations and brands that are often the subject of a wide and varied range of consumer opinions, staying on top of customer feedback (and all the useful information it contains) is pivotal. 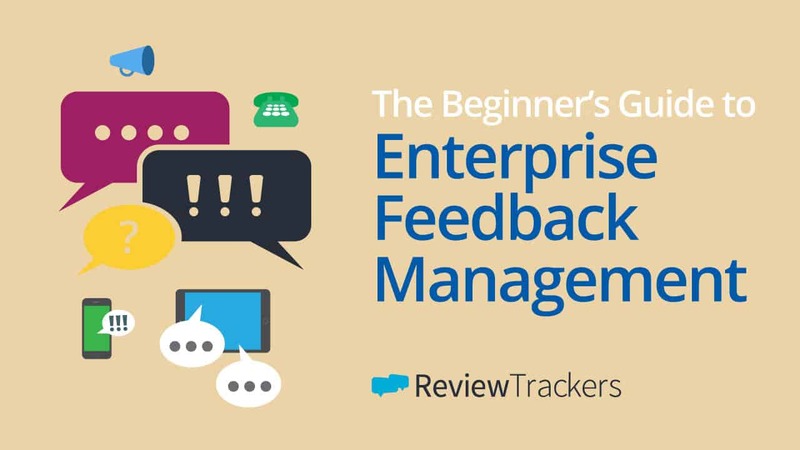 This is where Enterprise Feedback Management (EFM) comes in. Originally, Enterprise Feedback Management referred to the deployment of tools designed to help companies collect data and conduct surveys across multiple channels, like e-mail, website, phone, text messaging, even fax and in-store kiosks. Think back to those days when Facebook or Yelp didn’t yet exist. Did you ever receive an e-mail that gave you the chance to win an iPod or Amazon gift card — and all you had to do was fill out a 5-minute survey about a product or service you had purchased? That was probably an EFM system at work. First-generation EFM systems (2004 to 2008) were developed to cover multiple channels, but at the time, Enterprise Feedback Management involved mainly only customer survey distribution, data collection, and output analysis. Read more: Should you collect customer feedback using reviews or surveys? Then social media came along. Outside of surveys, customers began to share their thoughts, opinions, and experiences on social media, online review sites, and online forums and communities. Places like Yelp, TripAdvisor, Facebook, and even Google became consumers’ preferred platforms for talking about and engaging with companies. To respond to the emergence of multi-channel customer feedback, Enterprise Feedback Management systems evolved and began to offer, among other things, the capability to collect and parse feedback data from all these new sources. With an Enterprise Feedback Management system in place, you can collect, organize, analyze, and act and report on streams of customer feedback and Voice-of-the-Customer data. Whether you like it or not, some of this feedback and data will turn out to be negative. This is the case for even the biggest and most successful of companies. What’s critical is that you are able to pay close attention to what your unhappy customers are saying; they are, after all, your company’s greatest sources of learning. An EFM system with case management features can help you identify, address, and resolve any issues with the customer experience — not only by sending alerts triggered by negative feedback, but also by providing a structure where you can improve interactions in every step of the customer journey. That way, the critic who will have posted a 1-star review on Yelp had their complaint remained unacknowledged and unresolved can actually turn into a happy, satisfied customer who is likely to leave a positive recommendation based on your company’s ability to close the loop on customer issues. In a world where acquiring new customers costs 7 times more than retaining existing ones, an Enterprise Feedback Management system can boost your company’s customer retention strategy, resulting in improved satisfaction, lower churn, and increased loyalty. EFM ties the customer experience directly to financial outcomes, and can generate actionable insights to help you understand and meet customer expectations, identify high-impact issues, take steps to improve customer relationships, and target investments that deliver the most positive impact on your bottom line. Today’s Enterprise Feedback Management systems are designed to go beyond distributing surveys and capturing customer feedback. They also offer features for parsing and analyzing your customer data, and for gaining a better understanding of the ways consumers interact with your company across multiple touchpoints in the customer journey. With EFM, you can, for example, integrate your Voice-of-the-Customer data with your customer database and Customer Relationship Management (CRM) records. Or you can analyze the text and sentiment of your online reviews and social media comments, alongside NPS survey and customer satisfaction scores. This helps your organization achieve a more accurate and complete view — a “360-degree view,” if you will — of the customer, even amidst evolving customer expectations and trends. Simply put: Enterprise Feedback Management enables you to listen to and understand customers more effectively, in ways that drive strategic improvements and maximize bottom line impact. It’s not just about having smart survey templates or robust data collection technology. At a time when customer feedback lives on more channels than ever, EFM empowers companies to act on the best available information and create customer experiences that deliver on the brand promise.